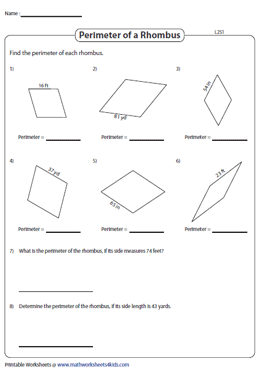 This collection of printable worksheets on finding the perimeter of a rhombus assists in familiarizing children of grade 6 and grade 7 with the concept. Walk through a range of topics like finding the perimeter of a rhombus involving dimensions with integers, decimals and fractions presented as geometrical shapes and in word format. Included here are worksheets to determine the length of the side as well. The dimensions are presented as integers ≤ 20 in the given rhombuses. 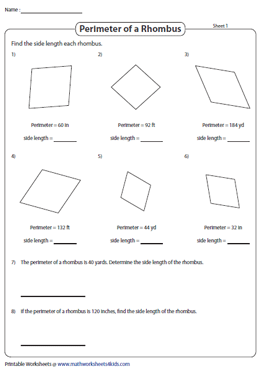 Add the lengths of all four sides to find the perimeter of each rhombus featured in this set of worksheets. Level up with this set of worksheets on finding the perimeter of a rhombus, where the side length is offered as two-digit integers. Substitute the side length presented as a decimal in the formula P = 4a, where 'a' is the side length. 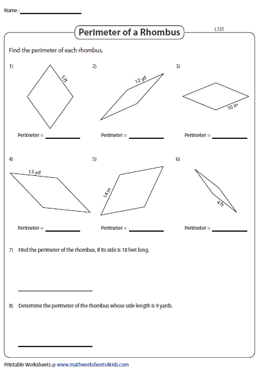 Multiply the side length by 4 to solve for the perimeter of a rhombus, in these worksheets for students of grade 6. 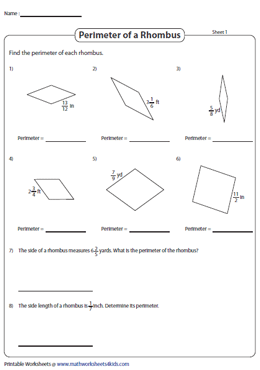 Students of 6th and 7th grade are expected to figure out the perimeter of eight rhombuses in each worksheet. Four times the side length gives the perimeter of the rhombus. The side lengths are in fractions. 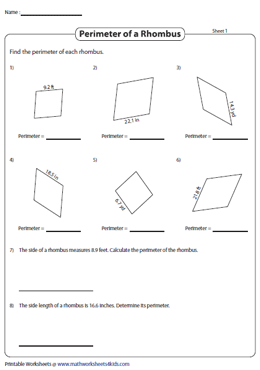 The perimeter of each rhombus is provided in this array of middle school worksheets. Divide the given perimeter by 4 to solve for the side length of each rhombus.